A rack of guitars stood idle, covered by a clear plastic tarp. Roadies stood at the edge of the stage, on the lookout for lightning in the distance, all while a wicked downpour hovered over the Ford Amphitheatre in Tampa, Florida. The rain made the audience under the canopy nervous as it soaked thousands sitting out on the lawn. At any moment, it appeared that the concert would be called off. 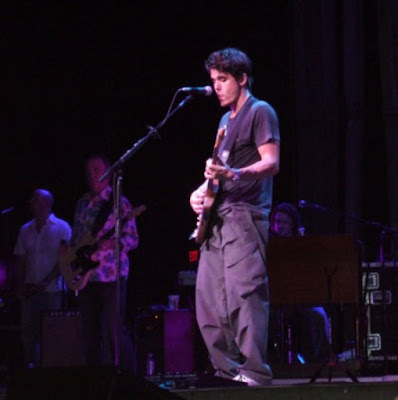 After an extended delay, and with the rain still falling, John Mayer determinatively took to the stage, his signature Fender Stratocaster already strapped on his shoulder. With his band at the ready, he unleashed a crying blues instrumental, seemingly willing the storm to stop. To the relief of the crowd, predominantly female, the inclement weather soon simmered. Mayer commenced, fittingly, with “Belief,” and the show carried on as scheduled. The high spirits carried over to the music, which sounded soulful and funky as compared to the more concentrated blues he often injects into his performances. “Good Love Is On The Way,” an early highlight with its propulsive groove, fired the fans up and onto their feet. “Waiting On The World To Change” followed in similar fashion, with Mayer howling out the words to his most socially conscious song to date. Sardonically prefacing it as “the greatest song ever written,” Mayer began the encore with an acoustic version of “Your Body Is A Wonderland,” much to the delight of the female constituency. The final song of the night, “I’m Gonna Find Another You,” saw Mayer’s band laughably dressed in matching outfits of red shorts, white tank tops, and knee-high socks. “It’s beautiful, isn’t it?” Mayer mocked as he sang the otherwise somber song. All kidding aside, Mayer thanked the thousands who had braved the rain to watch his performance. For those in attendance, not only was John Mayer’s musicianship more than evident, but so too was his genuine appreciation for his audience.